Woodlore stock the Zebra Billy Can, or 'Loop Handle Pot' as it is otherwise known, in four different sizes. This, the 16 cm model, is the perfect size when cooking for a group. 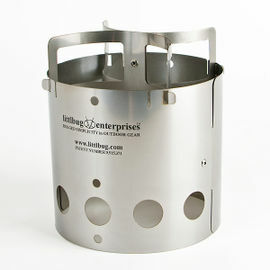 It can also be used with The Honey Stove and the Littlbug Junior Camping Stove. This product comes with plastic auto-lock lid clips included, but we recommend that these are removed when cooking over an open fire or on a stove. Zebra Stainless Steel Billy Can 16 cm is rated 5/5 based on 24 customer reviews. So practical around the house or out and about. 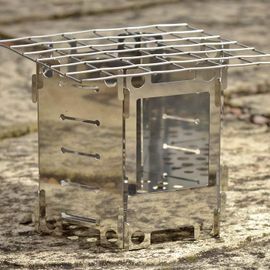 Great that I can securely store everything I need for outdoors, including stove, utensils and food all in one place. Probably need to drill a few holes in the inner pan for more effective steaming but that said I still managed to get asparagus cooked to perfection whilst I made soup in the main pan. Brilliant. 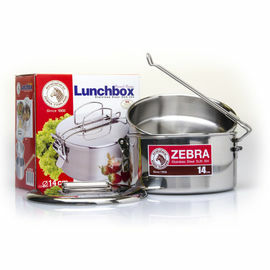 Billy pot arrived quickly and was recently used on a wild camping weekend for cooking on an open fire. Worked extremely well. There is no better billy in my opinion. My second Zebra and not my last. Nice shiny billys, shame about the plastic clips (which are in the photograph) which hold the handle up, but melt on the gas ring and fire. I spoke to someone in customer services who say they melt and shouldn't be used. Hello Mrs. Desroche. The plastic locking clips on the handles are simply optional extras which are included with each billy can as standard. These can be removed at any time should you not wish to use them. You can't fault these pots for bushcraft. Sturdy, well designed and a pleasure to use. Awesome little tin, well big tin as I got the largest one. It's well made and the lid locks into place nicely. The bonus for me is that it has a little zebra on it, all I need to do now is perfect my zebra noise so each time I use it I can make that noise and freak fellow campers out. Thanks Raymondo for another great quality piece of merchandise. Not tried out yet. But well built as you would expect. Woodlore prices are the best on the net and prompt shipping. 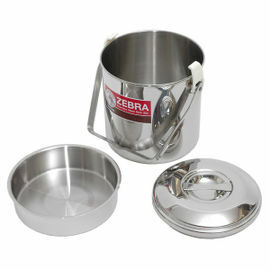 Used for boiling water for ready-meals on honey stove, no problems. Great Can. Very useful for cooking whatever you want. Even my breakfast bacon. You really want need many pots with this. Top quality. Very nicely made, should last forever. A cheap pot gripper makes it a really versatile piece of kit.